Just outside my front door there is a field of stinging nettles the size of half a city block. It is the healthiest plot of nettles I have yet to see. It was not always that way. There was an old barn on the hill above, that once was a milking barn and then held moonshine during prohibition. The activities in the barn helped pay the mortgage on the ranch and supported the growing family of settlers. When my husband arrived on the ranch the barn was falling down, due to lack of maintenance. The new owners made money elsewhere and simply used the ranch as an escape from the modern day stresses and routine. The barn was bulldozed into the ground. Remnants of the roaring Twenties and a family of farmers making a go at life in California would soon turn to dirt. That dirt would then be fresh breeding ground for seeds that were carried along the coastal winds, dropped by birds as they migrated or a fox as he marked a territory. The seeds that lay in the freshly disturbed earth were not those that dominated the surrounding grasslands. They were seeds that some call the name forbidden to utter in some circles, the dirty word that many groups dedicate themselves to seek out and conquer: Invasive Species. Poison hemlock, ripgut brome and medusahead all are icing on the cake of the conqueror. As these species drift around the world, looking for an opportunity to propagate, we have a choice to view them as a problem or an opportunity. So when the dirt became home to Italian thistle and poison hemlock, we put in the pigs. In nature, waste equals food, so if we are to mimic nature, everything eats and is eaten. When we want to sculpt our lives and our landscapes, that basic principle can help us avoid dissonance. The pigs did what they do: eat everything. They ate the roots of the plants because we let them stay long enough to feast on the starchy taproots of the thistle. Then we moved them off and let the ground rest and recover from the disturbance. Winter set in, and soon a diversity of plants began to establish in the pig fertilized and disturbed earth. We did not spread any seeds, just waited and watched as the drifters found a settling place amongst the diversity and chaos. 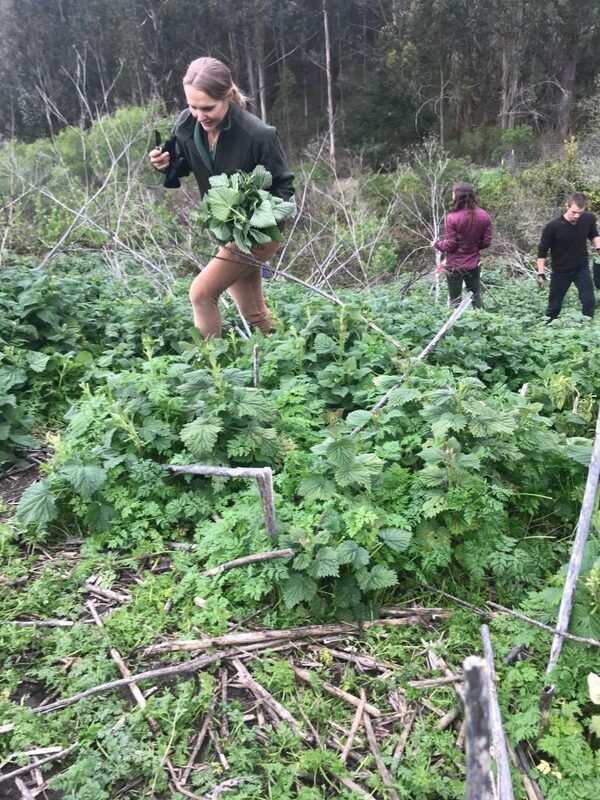 The result is a field of stinging nettle that is so healthy that the top leaves are the size of my hand—despite the drought—rivaling those of the Pacific Northwest, where everything is greener and bigger. So when life brings us stinging nettles, what more are we to do than to eat, a basic behavior we share with all life on earth. The act of gathering, preparing food and then the celebration of eating helps us to tap into that familiar comfort of not only surviving, but thriving. Each species has a role and once we begin viewing this diversity as something to celebrate rather than select, isolate and destroy, the better off our lives and landscapes will become. The ranches on which our livestock graze support 66 species of birds and 157 species of plants. In all this diversity there is food being grown. How we tend to that food source is up to each and every individual. 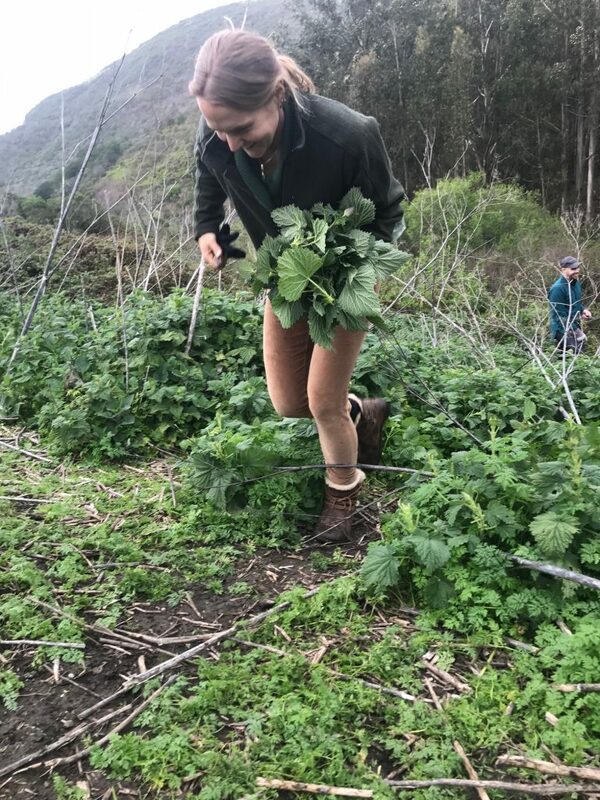 For our family, in spring, an abundance of stinging nettle means it’s time to make stinging nettle chips! 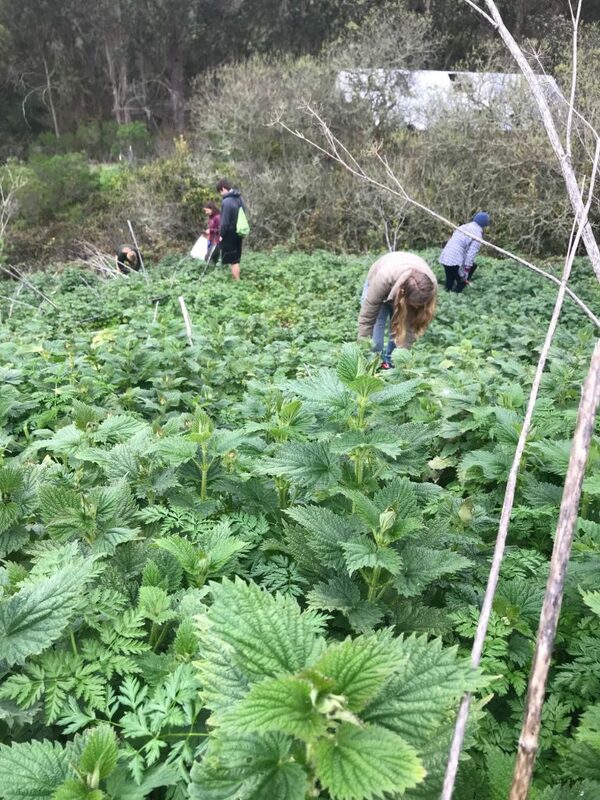 Harvest the nettle, be creative, collect as many as you can. See page 211 of Dawn Again to learn how to harvest without gloves. I also recently worked with my daughter Quince and I held a bag under the plant while she carefully cut the leaves with scissors. Enjoy the adventure of interacting with the plant. Find a bowl large enough to fit all the nettles. Pour in the olive oil and vinegar about 3 parts oil to one part vinegar. Stir in the nutritional yeast until you have a slurry. Add in a couple pinches of salt to taste. Set all the trimmed leaves of the stinging nettle as well as the top group of leaves that form a bud. With a wooden spoon gently massage the oil mixture into the nettles until they are thoroughly coated. Pour in more oil as needed to coat the nettle. Take your time with this, part of the process is to massage out the stingers. Don’t tear the leaves, just work the oil into the surface. You know when it is ready when you pick up a raw nettle leaf, eat it and it does not sting your tongue. When you taste it, go through a sense meditation before you place the leave on your tongue. Then use your intuition to add more salt, fat or acid to the mix. See page 60 of Dawn Again for sense meditation. Preheat the oven to 300 degrees and place the nettles flat on a cookie sheet. Cook for about 20 mins, turning half way through until the leaves are crisp but not burnt. For the last several months, I’ve been participating in a challenge to walk a hundred kilometres in a month, alongside two of my siblings, and a bunch of our childhood friends. This month, the online group in which we report our progress and egg each other on, is called “100 km in Crazy December…We Got This! !”—a nod to the way December seems to zip by in a cloud of twinkle lights and shortbread cookies, with one’s best intentions scattered like so much shredded wrapping paper after a gift-exchange frenzy. Without that kind of external motivation and accountability, I know it’s easy for me to forget I live in a body at all. My month is shaping up to include lots of time at my desk (book rewrites are coming my way this week, plus there’s the work I do here at Propriometrics Press and on Katy Says, the bi-weekly podcast from our author Katy Bowman), lots of time at my sewing machine (making Christmas presents for family and friends, and yes, for myself! ), and lots of time in the car (my husband and I drive eighteen hours to see my family at Christmas). All of this, plus the usual hustle and bustle of the season, could set me up for a stressed out, sedentary month. But I’ve been thinking about the hashtag we use on social media: #practicewhatyoupublish, and I’ve asked some of our authors to share with me—and with you—their best tips. We hope you’ll find some inspiration for your own life here! While our life is rich with many amazing holiday experiences, it becomes harder to wake up and pull my cushion, sit and just drop into what’s in my body. And herein lies the paradox: the times when I most need to attend to my inner world is the time when I am least wanting to do it, because…there is stuff to do. Around this time of year I choose to do walking meditations instead of sitting meditations. 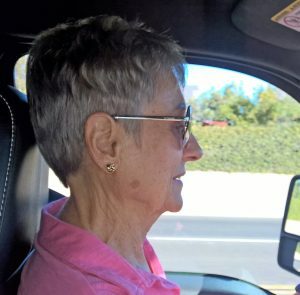 It’s a way for me to combine two of my favorite ways to stay connected with myself at a time when walking comes easier than sitting. This way my walk to the store can become an opportunity to drop in and be with myself and attend to emotions, thoughts, sensations, connections that are tugging at my heart. I can do it on my way to or from work. I can do it while walking with my partner. I usually choose one of three anchors for my walks. 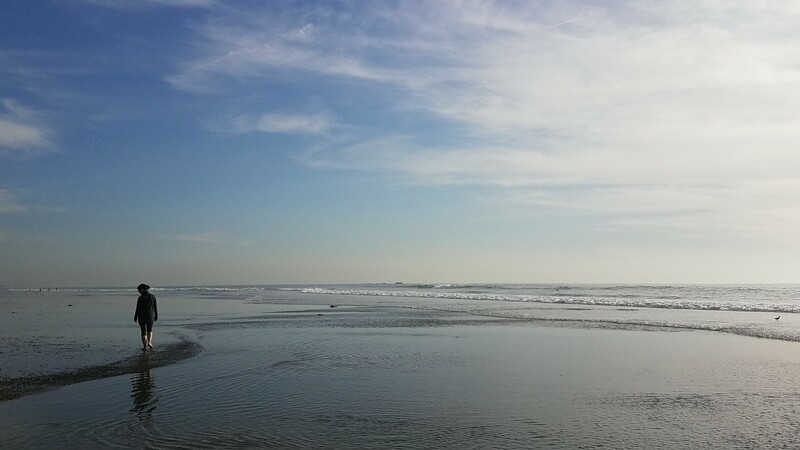 On some walks, I choose to attend to my breath, as I walk and become aware of certain thoughts, events, sensations, emotions or connections, I keep my awareness on my breath. This way I have a line connecting my attention to my breath and my whole experience organizes around it. A second anchor may be the ground. As I walk, I feel my contact with the ground—right, left, right, left—aware of the textures under my feet. A third anchor may be the colors around me—as my attention drifts I always come back to the colors and notice here is red, here is yellow. You can choose your own way to organize your walking meditations, and make this idea your own. During the holiday season, I am in the car a lot. Great opportunity to practice head ramping as explained in Dynamic Aging: Simple Exercises for Whole-Body Mobility. 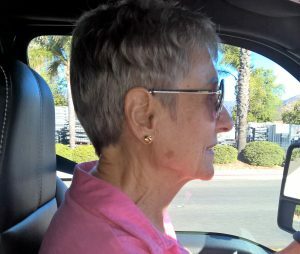 For more information on head ramping, check out our blog entry “As Long as You Breathe, Change is Possible” at www.dynamicaging4life.com. Winter brings time to breathe. Winter brings people together to sit around the fire and talk about the season, talk about our dreams, reflect, and imagine the future. I have been thinking a lot about the future. When you have kids it is hard not to. The changing climate, political system, and the rapid pace of tech growth are all subjects to talk about around the fire. There is something about sitting around the fire with other people that brings about a depth of honest conversation that is difficult to achieve in everyday passing. 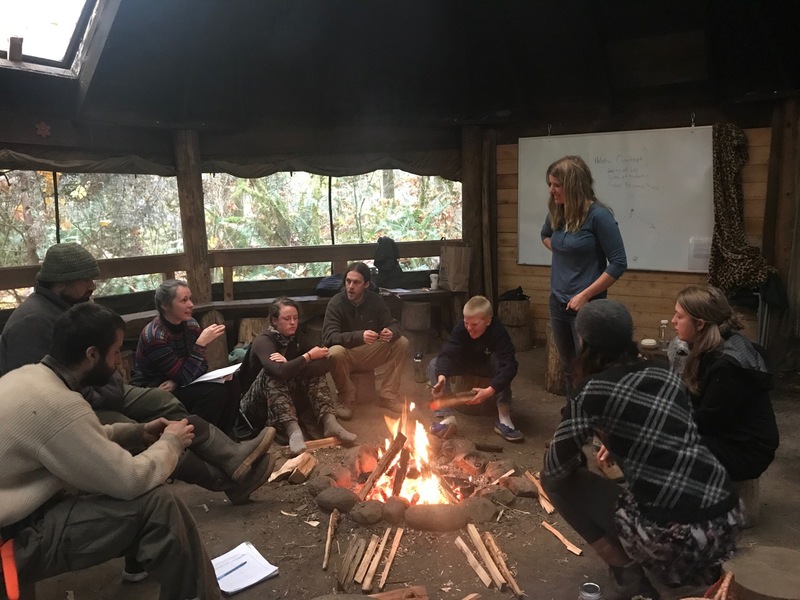 I recently had the chance to sit around the fire at Wilderness Awareness School while I was on my book tour in Washington. This was the same fire I wrote about in Dawn Again. That was 20 years ago. It has been burning nearly daily since that time. Each year a new group of youth comes to gather around that fire and talk, cry, dance, dream, and imagine the future. My books are always about movement—specifically natural movement, transitioning your body to handle more natural movement, and where movement can fit back into your life. When it comes to movement, the holidays can be stressful because with the addition of so many extra “things to do,” the bout of daily exercise is the first to go. For many, it’s the least connected thing to other elements of life and so is the easiest thing to set aside when all the other plans come in. The way I #PracticeWhatYouPublish is to, obviously, keep moving. I choose less convenient methods (read lots of things by hand!) of processing raw or foraged ingredients. I also like to celebrate with movement—to infuse the holiday with movement—so that we can move together (yay Vitamin Community!). I create exercise advents for my social media followers, giving them one exercise each day. 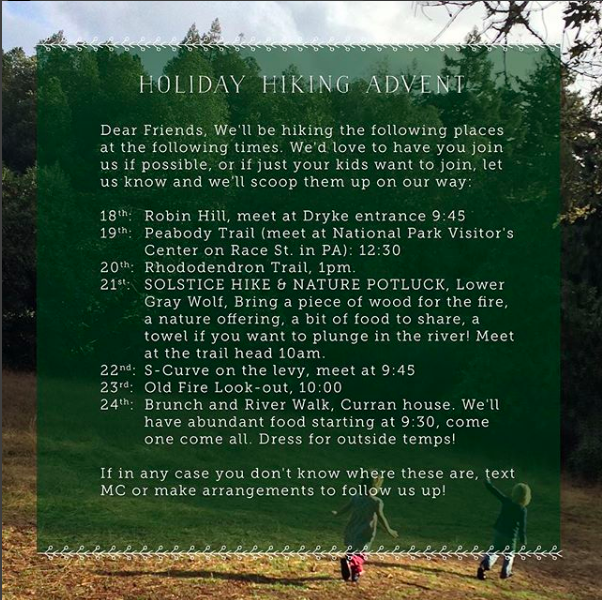 I send out a “Week Before Christmas Hiking Countdown” letting our friends know where we’ll be hiking and at what time, and that they (or even just their kids) are invited. 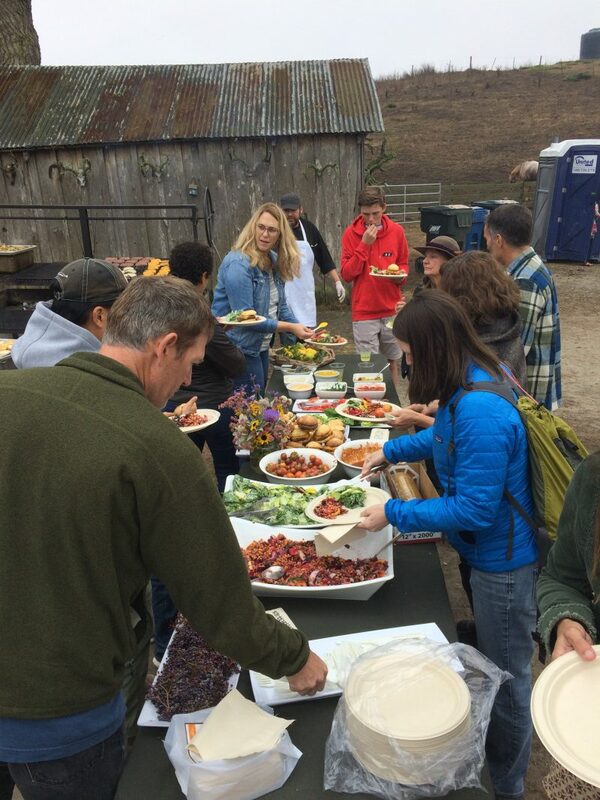 We hold a holiday-eve brunch for all our friends, often eating outside and then heading out for long walk down a local trail. In short, I’ve worked to make the holidays ABOUT moving. Movement is not only a great way through which to celebrate, movement should be celebrated. Movement is the gift! During the holiday season and any other time, I make sure to calf stretch several times a day. I leave a half foam roller in front of my sink in the bathroom. That way I can do a double calf stretch while brushing my teeth or just washing up. Detailed instruction for doing the calf stretch can be found in Dynamic Aging: Simple Exercises for Whole-Body Mobility. 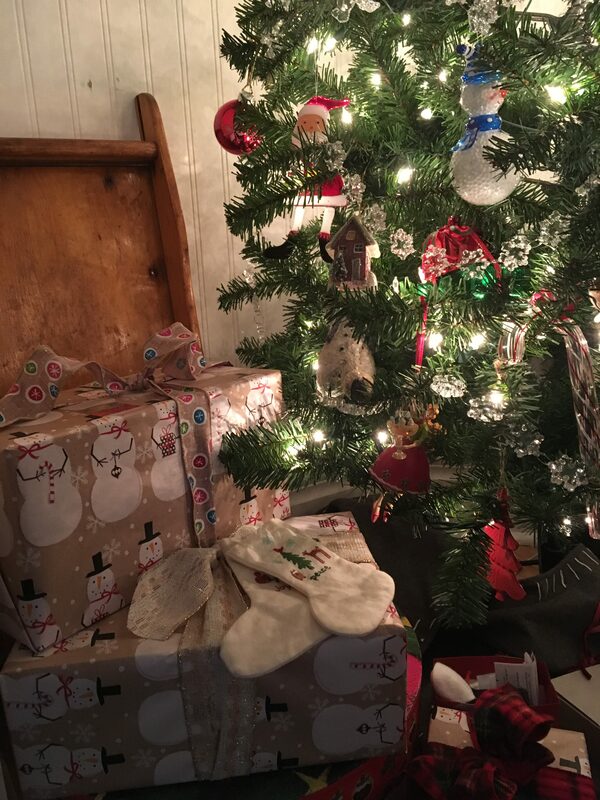 I have a couple of Entropy-Busting Ideas which helped me keep the chaos at bay, at least as regards Christmas stockings: early in the year, I hung up plastic grocery bags, one per child, on a rail in my closet kept exclusively for that purpose. (It’s a short rail, and we have six kids, in case you were wondering.) As the months passed, the bags filled with odd items that I found on sale, with mementos of some of the trips we had made, maybe a CD from a concert we had particularly enjoyed. Then it was a simple matter to add the traditional English piece of silver money, apple and satsuma in the toe, then fill it up chocolates, brain puzzles, and a giant plastic candy cane filled with M&Ms. The distinctive thing we did that comes to mind is extending the season and acknowledging the Magi by exchanging books on January 6, the Epiphany. Strong emphasis on extending the season! As for me, I’m excited to apply some of these tips to my December, and I hope you are, too! In my family, we called January 6 Little Christmas, and there was always a special meal, and a small gift for everyone around the table. I loved the way it brought forward the warmth of the season into the new year. From everyone here at Propriometrics Press, may that warmth be your companion long after the last gift is unwrapped and the twinkle lights are packed away. With Dawn Again: Tracking the Wisdom of the Wild successfully launched into the world (get some details on the launch party in Half Moon Bay right here and see some more photos here and here), author Doniga Markegard is getting ready to hit the road, returning to the Pacific Northwest, where her story began. With a nice mix of bookstore events and public workshops, you’ll have lots of opportunity to meet Doniga and hear about the experiences she brings to the page in Dawn Again. And Doniga has had some great chats with podcast hosts Daniel Vitalis, Diana Rodgers, James Broderick, and Roland and Galina Denzel! Plus, we hosted our first Facebook Live with Doniga on November 1, publication day for Dawn Again (well, our second live, if you count our trial live, which is linked above, in which Doniga and I discussed the launch party! ), so if you can’t make it out to one of Doniga’s in-person events, there are still lots of opportunities to find her in the wild. 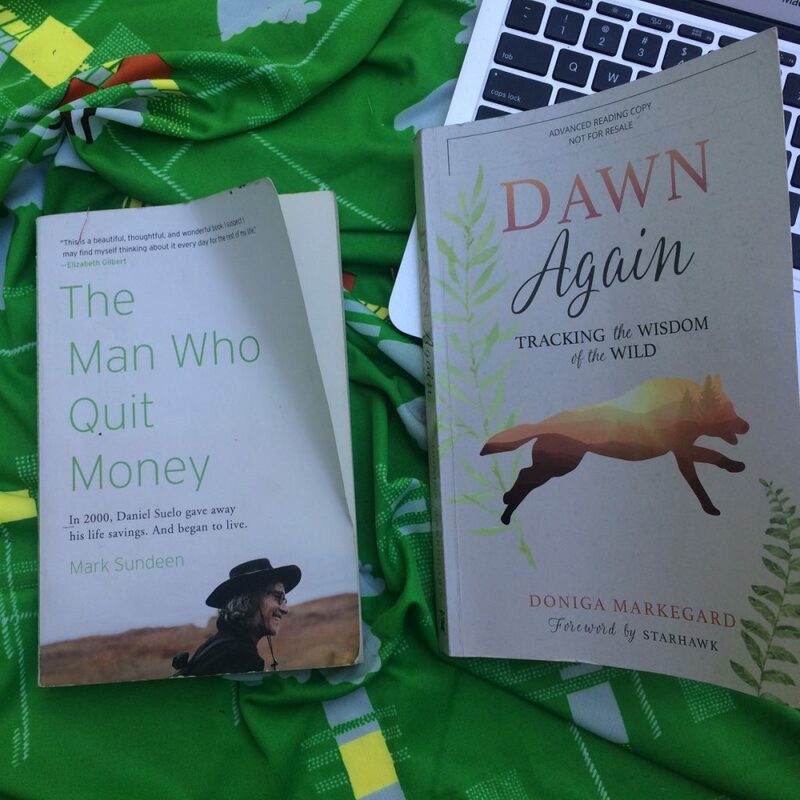 Speaking of the wild, we do love to see photos of our books being read out in the world, so if you are reading Dawn Again, take a photo and tag us on Instagram! And California friends, stay tuned, we are putting together some bookstore dates for early 2018! More about those as they firm up. As kids and parents everywhere get ready to get back to school—whatever that might mean in households and communities across the continent and beyond—we’re getting ready to publish Dawn Again, by Doniga Markegard. 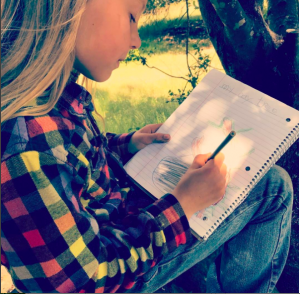 As well as being a memoir of Doniga’s time as a wildlife tracker and regenerative rancher, it is also a love letter to a nature-based education. Doniga was fifteen years old and rebelling hard when she finally found her way to the Wilderness Awareness School near her home in Washington State. Attending high school through WAS changed Doniga’s life for the better (you can read more about that here), and the experience continues to ripple and reverberate through her adult life, and into the lives of her children, all of whom are also students at their local nature school in San Mateo County, California. And Doniga has kept her hand in, too. She’s an instructor at Riekes Center for Human Enhancement, bringing what she learned in nature school to a new generation of students. Because Doniga is passionate about nature education, she’s looking forward to celebrating the launch of Dawn Again with an interactive Facebook Live event on Wednesday, November 1. We’re inviting nature school administrators and parents to take part, as well as anyone who’s curious about a nature-based education and whether it’s right for their family. The event is called What Comes After Nature School?, and it’s free and open to all who are interested. What: An interactive Facebook Live event called What Comes After Nature School? Long, hot, summer days such as we are having here on the east coast of North America produce in me the desire to do several things: go to the beach, with a stack of books in tow, lounge in the backyard, with a stack of books in tow, go to a cottage and laze on the dock, with a stack of books in tow, relax by the pool, with a stack of books in tow…yes, there is a theme emerging, you clever reader, you! This time of year, my eyes are generally bigger than the space available in my schedule for such prolonged bouts of reading, but I have managed to start a handful of good looking reads, finish one or two, and dip into several others to take what I can from them in the short bursts I have for such pursuits. This summer, I’ve been taking Baseball Life Advice, by Stacey May Fowles, with me everywhere I go (reading an essay on the beach while my brother listened to a Blue Jays game on his transistor radio and my niece and nephew frolicked nearby in the cold north Atlantic was one recent summer highlight), and then coming home to a pair of books by Elizabeth Strout on my bedside table. She is an amazing fiction writer and I am trying to figure out how she does what she does, so these are both re-reads for me. Speaking of re-reads, I’ve been hosting some special episodes of Katy Says, the excellent podcast by our author Katy Bowman. The episodes are focused on each of Katy’s books, so I’ve been re-reading her backlist this summer in preparation. Whole Body Barefoot is on the docket for the August 29 podcast, with Don’t Just Sit There coming up for discussion in September. You can subscribe to the podcast here. 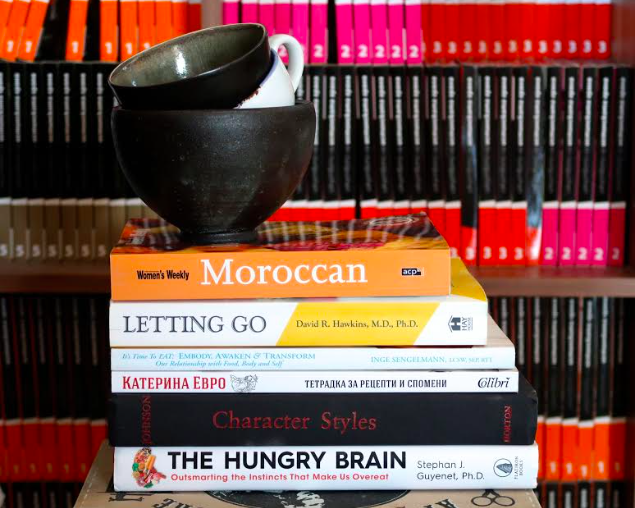 I could go on and on about my own stack of books, but of course, we’re a company of book lovers. Sleep Smarter Allowing ourselves to sleep better is one of the hardest things for us to do, so I’m down for the latest info on getting in more (and better) sleep. Movement Matters I’m a long-time believer in habit-stacking, even when each habit is tiny. Especially when each is tiny! Whether it’s health, the environment, or someone else’s welfare, things add up, and we can all do a little better. Movement Matters introduces us to small ways to make a big difference in all three areas—health, environment, humanity. Word by Word A gift from Mom, who gives the best books! We (Mom and I) love words, trivia about words, the history of words, wordplay. As a writer, I can always improve, and this book is a fun way to do it. Throne of Glass Guilty pleasure. I’ve had it for a while, but when my friend Lou’s daughter talked it up, I moved it to the top of the pile. Don’t tell anybody, but it’s basically research for my next novel. Shhh…. “Here is my summer list on the go as I travel in Europe 😉 In the background you can see that I took the pictures in our home office in Sofia, where the colorful books on the shelves in the background are the collection of the Art of Real Food recipes, which I authored alongside photographer and designer Diana Shingarova. The home office is where we both work and cook, shoot new recipes and keep a large collection of dishes, silverware and backgrounds for the food sets, hence books and cups are everywhere. The Hungry Brain I am fascinated by how we make choices and what it is about human behavior that intersects dangerously with the way the food supply has changed. This book is helping me gain a deeper and more compassionate understanding for the many ways in which our ancient brains have to navigate supermarket aisles and restaurant menus. Character Styles More text-booky, and a classic in the field of human personality research. I have spent the last few years learning how early childhood experiences shape our character and how marvellously humans adapt to difficult circumstances and survive. I am halfway through this amazing resource and can’t wait to read more on my vacation. It’s Time to Eat Inge Sengelmann tells of her own experience with emotional eating, how autonomic nervous system dysregulation is at the core of our distorted relationship with food and offers incredibly helpful self-inquiry at the end of each chapter. This is my third time through this book as I am also preparing to teach a retreat on the subject of eating and emotions and I keep finding gems of self-discovery and self-activation and empowerment. I think understanding and normalizing how we relate to food and pleasure is the fuel of hope for anyone dealing with emotional eating. It took me many years to heal from emotional eating and there just aren’t enough honest and scientifically valid books on the subject. This is definitely one of them. Katerina Evro – memoirs and recipes This white and red book you see is a beautiful collection of memories and recipes by one of the most inspiring, gorgeous and feminine Bulgarian actresses. The book is a mix of old black and white family photographs and head shots of the actress, close ups of mouth-watering recipes and many pictures from more recent adventures and trips. My partner in photography and cooking Diana Shingarova was the designer and photographer of the project, and I am so happy to finally see the book here in Bulgaria. Letting Go I got this book as a gift from the lovely Lucy—a colleague and friend in the Netherlands where we just went to teach a certification week for Nutritious Movement. Lucy knows if anything concerns emotions and unraveling what they are here to tell us, I am all ears—so she got me the perfect gift. I love the work Hawkins has brought in the world and the entry points for working with emotions he offers deserve attention. I didn’t own this one, so it was both serendipitous and plain cool to get it as a gift. “The Fugitive Gesture allows me to stare at, examine and marvel at the gestures of people like Nijinsky and Gene Kelly. It’s thrilling to see their invention and clarity. The photos go back to the 1800s and include Inuit to Martha Graham: photos taken before I was born yet inform me of their feelings and power. Joseph Campbell (Thou art That ) transforms religious metaphor and includes the Gospel of Thomas. And like Jung, reconciles the seeming dichotomy of feeling and thinking, sensation and intuition. 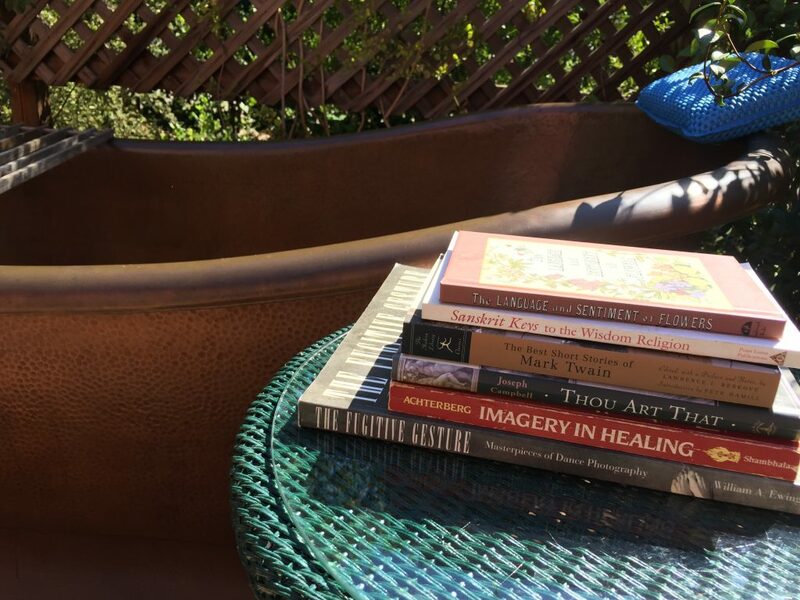 Imagery in Healing unifies and mystifies at the same time; another enigma. 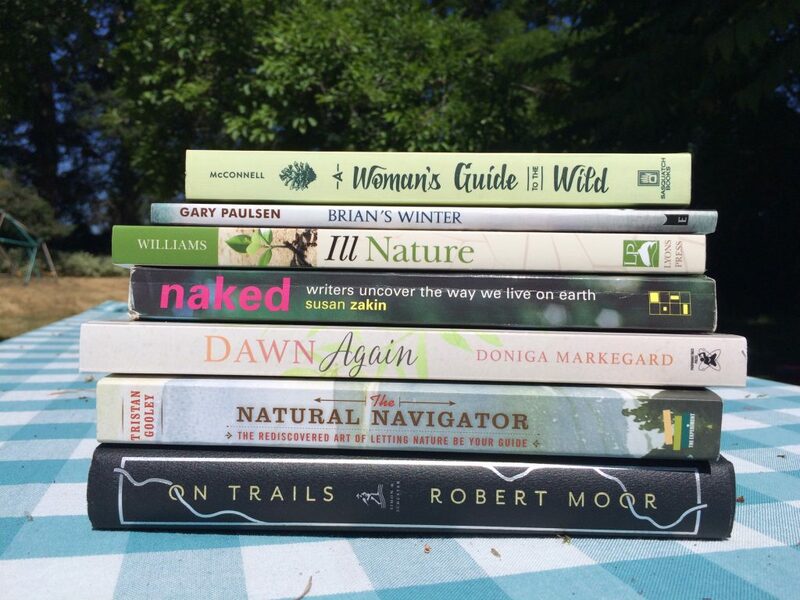 Michael Curran does all the indexing for our books, so it’s no surprise to see Dawn Again in his stack. 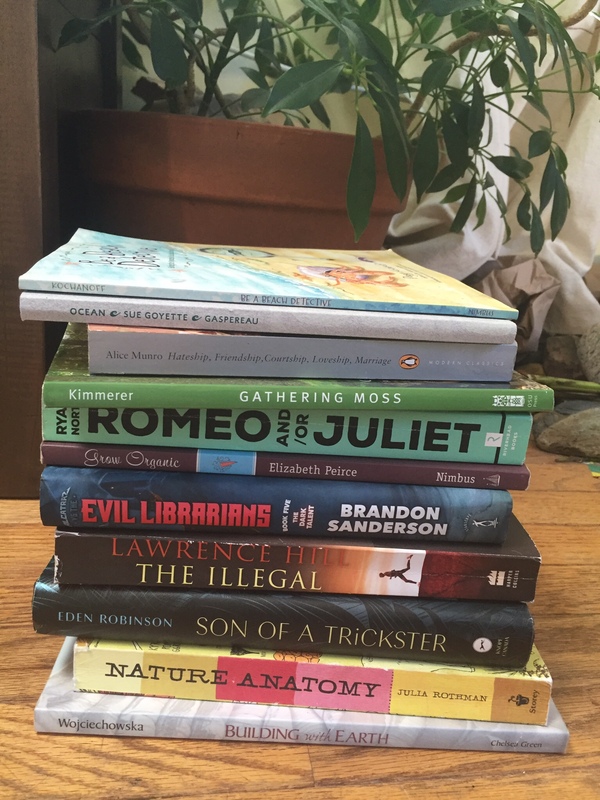 Penelope Jackson is our editor-in-chief, so she is awash in books pretty much all the time. She says: “I’m always working on four or five books, and I’m always reading at least that many for pleasure. 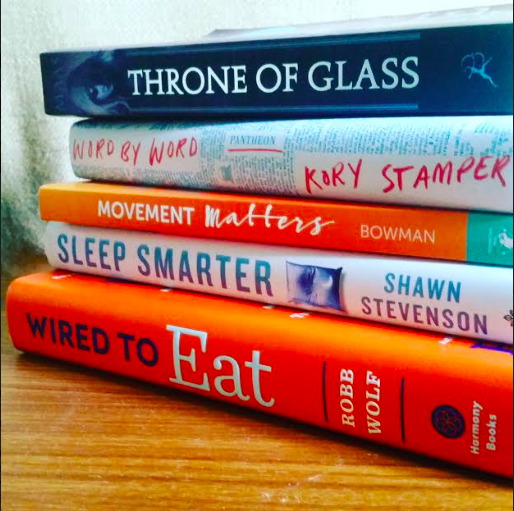 These are just a few of the books I’m spending time with this summer. 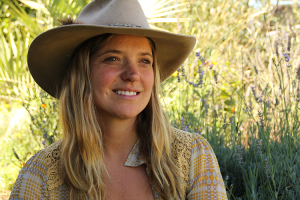 Elizabeth Peirce’s Grow Organic is my gardening bible—a fantastically useful, encouraging, award-winning resource I had the pleasure of working on. Ocean by Sue Goyette is my constant companion, as are her other collections of poetry, and she lent me Son of a Trickster, which, up to page 47, at least, is gorgeous and funny and rich. We take Be a Beach Detective to the ocean with us to help my 6-year-old decipher the nature clues around us, and my 9-year-old and I both love Brandon Sanderson’s ridiculously funny fantasy series Alcatraz Vs. the Evil Librarians. Robin Wall Kimmerer’s Braiding Sweetgrass changed my life; Gathering Moss would have if I’d read it first (and I got to do a moss workshop and walk with her recently; pinch me). Romeo and/or Juliet, a choose-your-own-adventure-style approach to the classic, is whip-smart and RIOTOUSLY FUNNY and creative and deep; I dip in and out of it and I still don’t think I’ve read every page. Alice Munro and Lawrence Hill are perennial favourites. Nature Anatomy is both beautiful and very useful to have around the house, and it taught me about stinkhorns, which is a very funny mushroom I accidentally grew in my garden, which was the highlight of my very excellent summer so far and which I wouldn’t have otherwise identified. Building With Earth feeds my daydreams. As do all books, I suppose. You can tell Penelope and I have similar approaches to summer living. 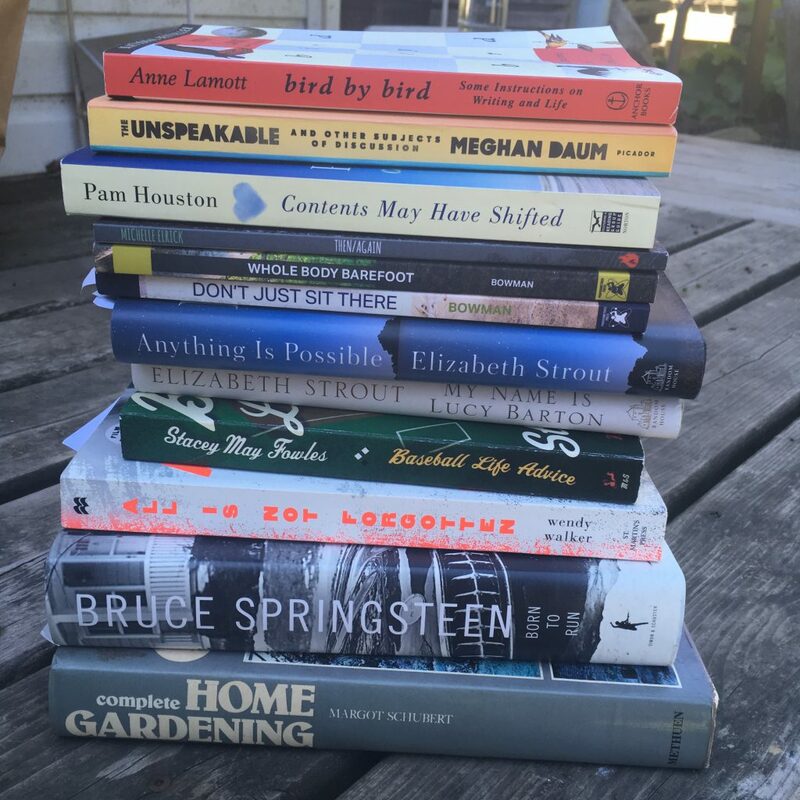 And finally, author and publisher Katy Bowman writes: “I read a lot during the summer, often outside (see some of the positions I frequent here). We’ll be sending it off to press this week, and we’re making lots of plans for launching it into the world November 1. Meantime, it is available for pre-order through our website. As a thank-you for ordering this title in advance, we’ll give you access to an exclusive audio file called Tracking for Beginners, in which Doniga Markegard guides you through some of the first steps in tracking wildlife, guaranteed to help strengthen your relationship with nature, no matter whether you are in the middle of a big city, in small town, or in the wilderness. 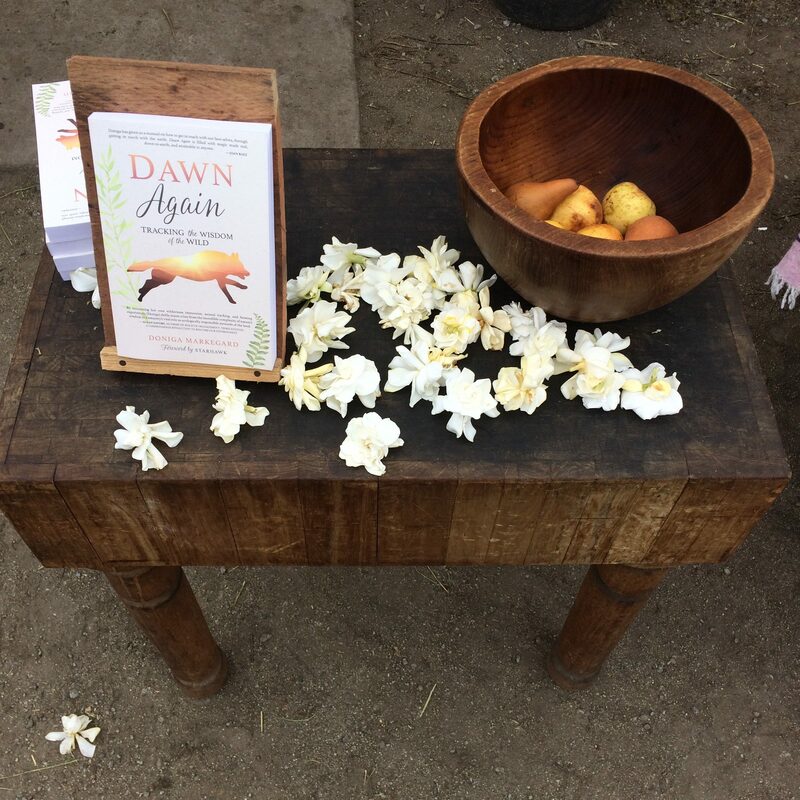 Order your copy of Dawn Again here—pre-sale closes September 22. 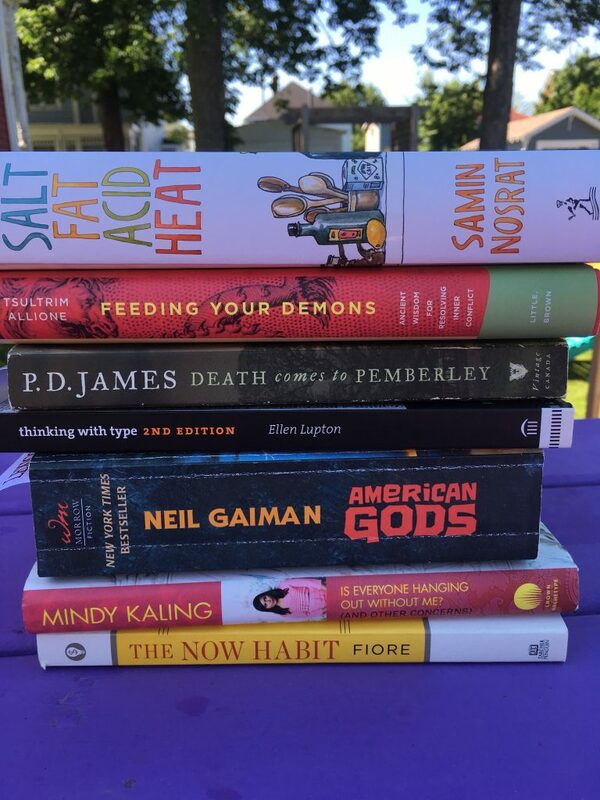 Meanwhile, if you need me, I’ll be on the beach, or the dock, or the poolside, or in the woods, with a stack of books in tow. Hope your own summer days are similarly stacked! 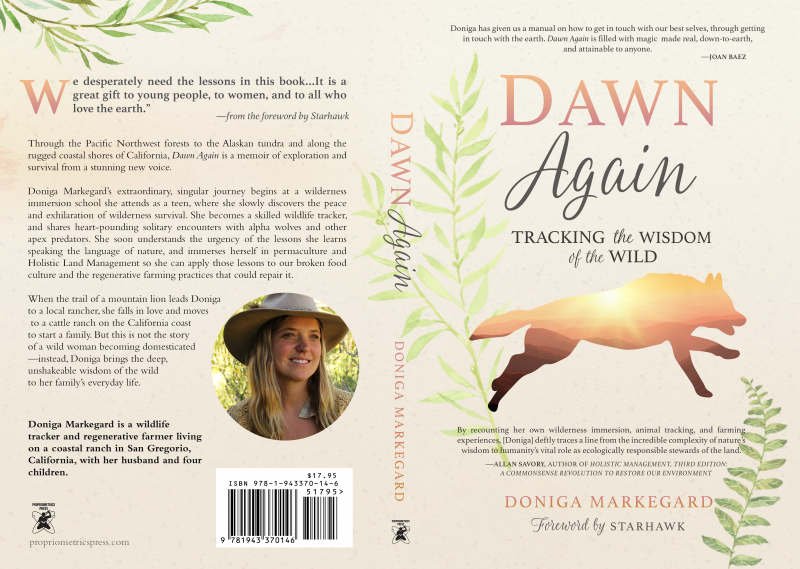 This fall we’ll publish Dawn Again: Tracking the Wisdom of the Wild, by Doniga Markegard. We’re excited about this book (Starhawk is writing the foreword!! 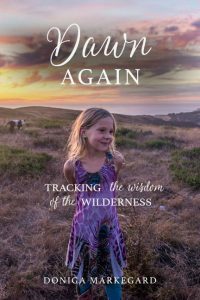 ), a memoir that traces Doniga’s life from the time she was a teenager seeking direction and meaning, through her time at the Wilderness Awareness School in the Pacific Northwest, from her studies with Lakota elder Gilbert Tatanka Mani, to tracking mountain lions along California’s rugged coast, to falling in love with a rancher named Erik and starting a life and a family with him. Doniga’s understanding of the natural world, and the lessons it holds for all of us make this memoir a must-read for anyone longing for a deeper connection with nature. When you order Dawn Again through our pre-sale, you get access to a thirty-minute long audio file called Tracking for Beginners, in which Doniga offers tips and advice so you can get started right now, no matter where you are. When you think back to where you were in your life when you began learning to track, what kind of road might you have followed if tracking and wilderness studies had not presented itself as an option? That is an interesting question. I discovered tracking when I was searching for meaning in my life and a direction where I could feel part of the solution to some of the destructive things I saw happening around me. As a child I would often ride my horse on logging roads and witness an entire hillside clearcut. When I began traveling the county and seeing crop dusters spraying chemicals on long rows of monocrops I became further disillusioned. I had grown up close to nature and the beauty of rivers and trees. It was not until I began tracking that I connected the pleasures I felt or fully understood that the life I experienced growing up was being threatened by over extraction of resources. I think if I had not discovered tracking I may have followed what the people around me were doing instead of following my heart. It is hard to say where I would have ended up because my life took so many turns, yet I was always led back to nature. What do you think Gilbert Tatanka Mani saw in you that made him want to work with you? Gilbert did not just mentor anyone who came along. Some people would visit searching for spirituality and he would remain silent. He had a way of knowing what stories and lessons to share at just the right moment. I think what he first saw in me was a passion for learning everything about nature and he admired that. At first he did not pay too much attention but taught me small things such as how to make prayer ties or a sacred song. When he would share something with me I would immediately take it on in my life and practice it daily. It was this dedication that he saw in me and led him to share more. When I would tell Gilbert what I learned and stories about my time in nature he would share more. This grew to a very deep spiritual relationship, one that I had not expected going in, yet emerged in the most natural way. You kept extensive tracking journals that you were able to go back to in writing this memoir. What went through your mind as you pored over those? I loved looking back at my old tracking journals. It was like peering back in time to the first discoveries of the stories that are all around us. 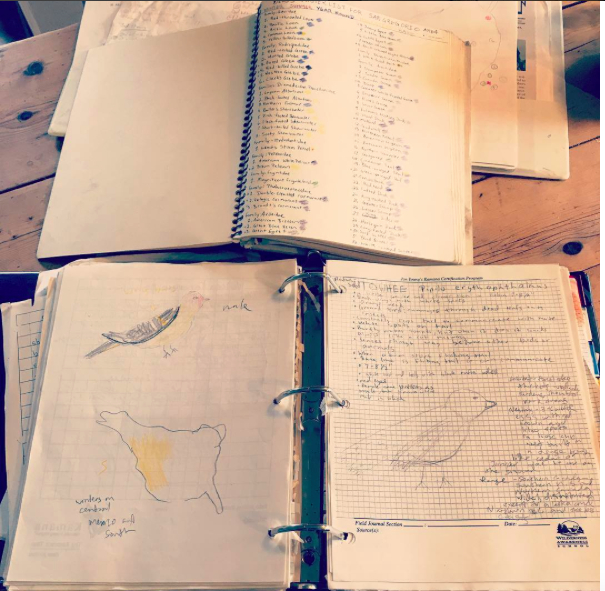 The maps I drew immediately brought up vivid memories of the places I frequently tracked. I could almost smell the cottonwood buds and hear the rivers and feel the rocky sand beneath my feet. What has tracking brought to your life? Tracking has brought a deeper sense of my own connection to everything around me. It has also brought me a deeper connection to myself. When tracking an animal I put myself in the past, present and future in order to gain clues about the animal, what it was doing, where it was going, when it passed by and why the animal was moving the way it was moving. When I track I ask a lot of questions. These types of questions, who, what, when, where, why and how can be applied to anything in my life. Solving mysteries of tracking can convert to problem solving at my own ranch. Tracking also brought me a very keen sense of observation. While tracking I am constantly looking at the natural cycles around me to take in the bigger picture of the story. 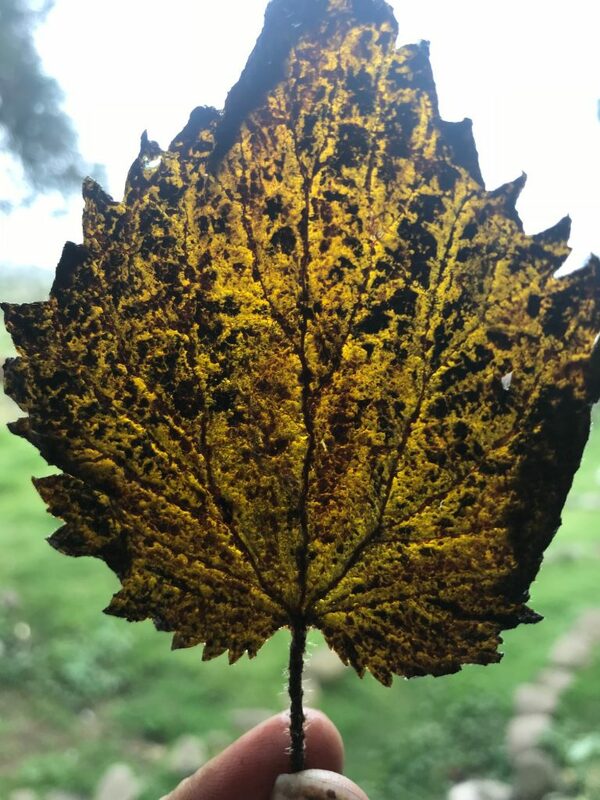 Now that I am practicing regenerative agriculture, that keen sense of observation has been key to making good decisions for our family and our land. 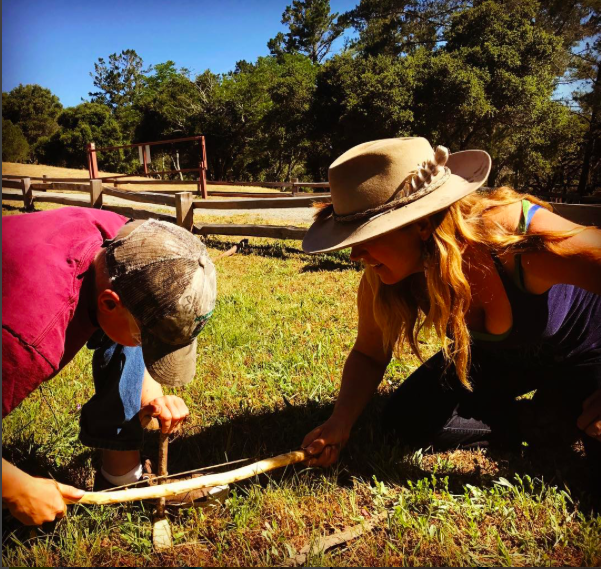 What did you learn about your own experiences in tracking, ranching, and raising a family by writing Dawn Again? Writing Dawn Again provided me with a time to reflect. I think often times people do not take the time to do that in their lives and they may keep moving forward without learning the lessons from the past. Writing the book also gave me an opportunity to be thankful for the gifts I have been given. I felt so grateful for the lessons of nature, the mentors in my life and my family that have all shaped who I am and the outcome of what my life has become. Often when I was writing and thinking very hard about how to approach a chapter or a subject I would do research of things that were already written, but that did not give me the feeling that I was complete about my writing. 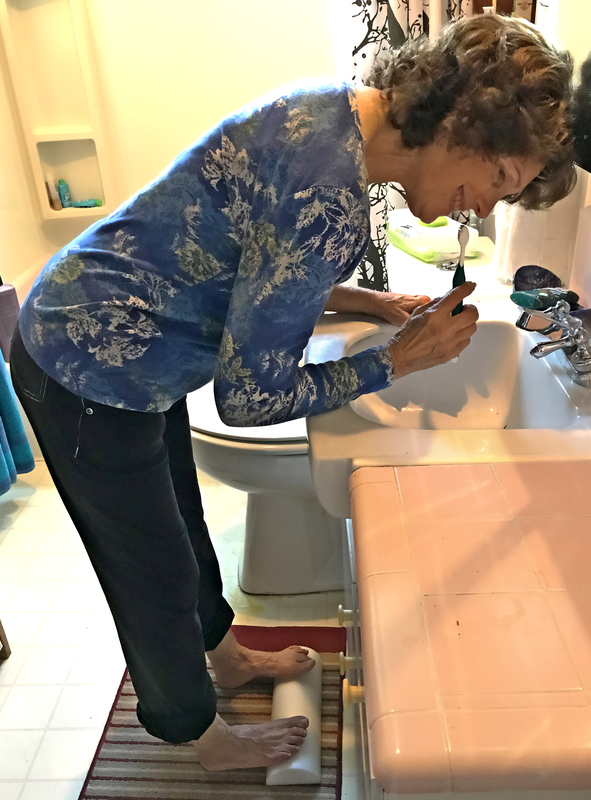 What helped me to round out my stories of the past was when I walked outside and interacted with nature, or sat down and had a conversation about the subject with my husband, children or friends. One time I was writing a story about a coyote and I walked out my front door and a coyote was standing up on the ridge. When I was writing I was paying very close attention to everything around me, just like tracking I was looking into the past, present and future through all of my senses. What really came out when I was writing was the less tangible sense of instinct. I just got into a zone, like when I trail an animal. My fingers moved and not many thoughts went through my head as the words came on the screen. See and hear more from Doniga Markegard here on the San Francisco Exploratorium website, where Doniga is part of a permanent exhibit called Listen. will be published November 1, 2017. Our pre-sale is on now, through the summer. You can follow Doniga Markegard on Instagram to see nature through her eyes, and to glimpse some artifacts of her tracker past. 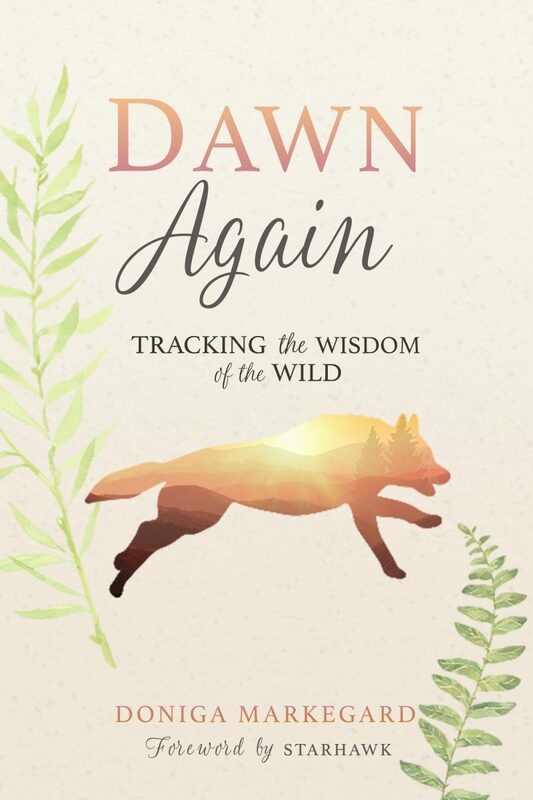 This fall, we’ll publish Dawn Again: Tracking the Wisdom of the Wild, by Doniga Markegard. It’s a riveting memoir of exploration and survival. As a young girl, Doniga Markegard was thrown from her horse and knocked unconscious. She remembers an out-of-body experience that revealed to her the great mystery at the heart of life. In Dawn Again, she writes of the journey that experience sparked. At a wilderness immersion school, medicine people and wildlife trackers train her in indigenous ways. Her search for an authentic life takes her hitchhiking across the West and to Alaska, where she falls deeply in love with tracking wolves and the rigors of surviving in the wilderness. Doniga seeks a vision and discovers her purpose, only to find herself on a cattle ranch, falling in love and starting a family, and learning a new way to apply the deep, unshakeable lessons of the wild. We’re really excited about this book and we knew it needed a really special cover. So we turned, as we do, to our incredibly talented designer, Zsofi Koller. She did not disappoint. We took the opportunity to chat with Zsofi about the cover for Dawn Again, and what went into making it. How do you approach the design of a cover for a new book? Book cover design is about making an intangible tangible. On one hand, there are endless options. ENDLESS. On the other hand, if you listen to what the book is about—and I mean, listen with ALL your senses—some ideas become clear tracks to follow. And I follow those tracks, and see what happens. When I’m doing first cover design, the book itself might not be written fully yet, or I might not have access to the full manuscript. So I’ll often get a debrief from the editor or author about the WHAT of the book. Not just the what—also, the spirit and heart of it. And I’ll daydream about it, and I’ll go to the bookstore and roam around thinking about it, and I’ll look at approximately a billion things online to get ideas. And eventually I start to pile together ideas from my mental toolbox, and often times visual cues from my teammates, and it starts to take shape. And then I run my first concepts by our team, and we take it from there. You chose not to use a photograph for this cover. Why not? But it wasn’t the right idea for this book. This book isn’t best expressed by a photo. There’s a side of introspection, of spiritual exploration, that is best captured by a slightly more evocative imagery. So the thought of a wolf that embodied a sunrise felt too perfect to not use. What were some of the particular challenges in designing this cover? In total honesty, this cover didn’t feel like it had challenges. It came together pretty seamlessly. There were a lot of different iterations of sunrises and wolves though! How do you know when you’ve landed on the right design? When it makes someone on the team cry. And I can just feel it, too. When I come back and look at the design 24 hours later and still love it, I know it’s working. When I want to show it to my husband, it’s working. When I want to sweep everything into the garbage bin and keep working, it’s not right yet. And there’s really no short cut to the process. Sometimes it takes less time, or more time, but it’s always a process. What do you most like about this final design? I love the colour palette. A lot of our covers tend to be quite bold, which I love as well, but I enjoy the softness of the greens, pinks, oranges, and cream in this cover. It certainly feels true to a glorious dawn. I’m also very fond of the fonts we landed upon. A good font for a book is a little gift that keeps giving. I’m so looking forward to the interior design—the pieces have been laid in play so nicely by the cover, it makes the whole design process flow smoothly.